Who would think you could have your bubblebath in your shower? Now you can, this little bathtub filled with bubbles and a duckie will look adorable in your shower soap drainer. You will not be having any problems getting anyone to have a shower. 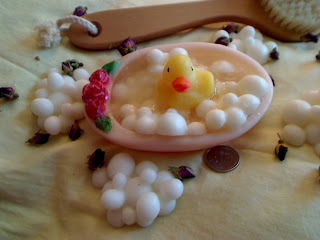 The bubbles and duck can also come separately, as guest soaps. There are simply no rules when it comes to the way you want to have your soap. Gone are the days when soap was just soap, now they look fun, smells fantastic, friendly to the skin and adds that little something to the shower!